We are pleased to announce that after a few months of renovation and reconstruction, the new oubliette is finally open for business! We have a holding pen that can comfortably house an elephant and a camel. Our torture chamber recreation room is top of the line, and prisoners will be housed in a more comfortable setting--we installed a small window that requires you to stand on your tippy-toes in order to see the view. But at least you have a window! The one thing we did keep was the entrance. It is still a hole that we can drop you down into at our leisure. 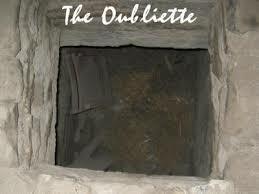 Enjoy the new oubliette and always remember to KEEP IT CLEAN (with or without Al Jardine). Re: The Renovations and Reconstruction of the New Oubliette Are Now Complete!!! Does that still mean myself, Mr. K and FakeFreef are still in it? Or are we let off due to the ship change, lol! What's the tales in 2019 for the oubliette, T? ... Does this place still exist? I`m afraid you are all out of luck. They only eat cooked meat. 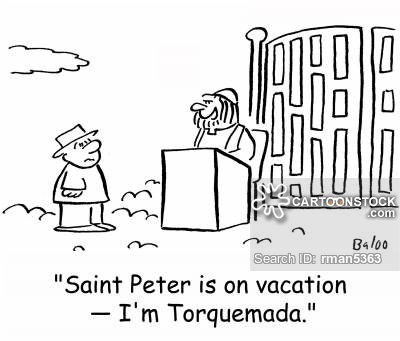 They`ll toss you in the air and even cook you themselves. Very clever aren`t they? Convenient, and hopefully for you, quite painless. Oh, well. I suppose we better stay where we are. It was an interesting diversion while it lasted. What's on the menu tonight, FakeFreef? Not that recipe you got from underwearjock at our old Crapatalk forum, I hope. I'm not eating that muck. We're staying put, FF, it's too risky. So you can stop all this "poopee doopee" nonsense and start preparing dinner (using the word in its loosest sense--in more ways than one, I fear).